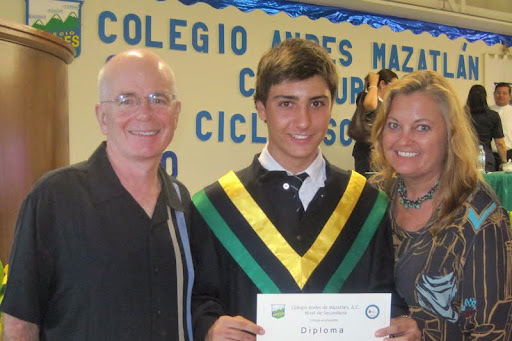 Three Years in Mexico with a Junior High School Student | ¡VidaMaz! We moved here three years ago. 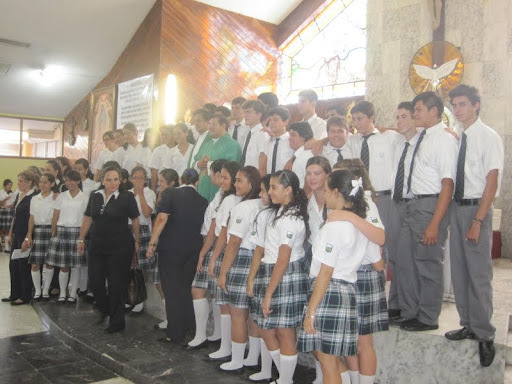 Today our son graduated from secundaria/junior high/middle school. He has gained enormously by living here, as have we. When we moved here our son didn’t speak much Spanish; now he pretty much passes for Mazatleco if Mom and Dad aren’t around. Bilingualism is way better than speaking only one tongue, for sure. After 3 years our 15 year old is not yet grammatically perfect in Spanish, but then, he isn’t really in English, either 🙂 Key for me is he is now extremely comfortable speaking Spanish or English, one on one, in a group, public speaking, in a formal meeting with adults. He can lead his peers, he can motivate, he can tell jokes and stories and crack people up, in both languages. Three years well invested, and at least three more to go. When we left the US, our son’s mind was on our neighborhood, city and maybe the state in which we lived. He didn’t think about much beyond that in the world, and he didn’t like languages or cultures. He was a science, history and math guy. Now, three years on, he knows what it’s like to live as a minority member of society. He has gained confidence making new friends, going into new situations and figuring out how to get along. Not much intimidates him. He now loves languages and thinks he’s good at learning them, anxious to try out Italian and French. He’s gone from wanting to see movies dubbed into English to wanting to see movies in their original language, with subtitles if needed. He gets that the original provides the most honest portrayal and feeling. He is keenly interested in international affairs, environmental concerns. He can recite to you UN resolutions and the rights of women, children and people worldwide. He still loves history, and likes science and math. He talks of going to university in, well, South America, Italy… he now sees that there is a whole world out there. This is the primary reason we moved here: to provide him a broader worldview, and I thank goodness that he has done such a terrific job in this regard. As our son graduates to high school (or preparatoria), he looks forward to a new adventure in a larger school with only a few of his current classmates. Being in a small private school now, there is a bit of a reshuffling as students decide where to study for the next three years. His graduating class of about forty will be spread out across various schools in town, breaking up this close knit bunch of kids who entered and experienced the hardest years of adolescence together. This is in sharp contrast to the normal trek in the United States, of elementary schools merging into middle schools and middle schools merging into high schools, where groups of friends remain intact and take on new friends. With this new school, he will enter as a Spanish speaker and a bit of a “local.” There will be close to 275 kids in his grade, so the huge size increase may be the biggest adaptation he has to make. Before we moved, our son gave us strict instructions that he didn’t want to live in Mexico like some “rich gringo.” While of course the average wage in Mexico is much lower than that of the US, which he was speaking to, his eyes have been opened to just how rich the rich can be in a country like Mexico, where there are huge gaps between rich and “middle class.” He is able to describe class differences, their customs and values. He has become a “blended culture” person in the sense that he now knows what he likes and dislikes, personally, about the various cultures with whom he has contact. He doesn’t judge, knowing every worldview is “right,” but he doesn’t let himself get lost, either. I’m proud of him for that. Thank you, Mazatlán. Thank you to his teachers, tutors, mentors, Scout leaders and friends. And to you friends, many of whom we now love, too: best of luck in prepa! Remember to maintain these precious existing friendships! Inspiring, to say the least. You have given him an amazing gift that no one can ever take away…and one that (we all know) will continue to be key to who he is…and who he becomes. Thanks, Randy. Your life is definitely an inspiration as well. Felicidades to your son! Best of luck to him next year in high school. Thank you, Katie! Are you living in Mexico with kids? Thank you, Anonymous. Best of luck with your move. If we can be of any assistance to you and your family please let us know!